A Clinical Body Therapist's minimum education requires 2,000 hours of study. Subjects include anatomy, muscle and skeletal physiology, and therapeutic massage. The certification was earned in one of America's most prestigious body therapy schools: Health Enrichment Center. The instructors include an M.D., Chiropractor, Osteopathic Physician and teachers with Master Bodywork certifications. Beyond this training Carl has completed over 500 additional hours of training in British Sports Therapy, energy fields and osteopathic techniques. After 27 years as a Human Resources Director, specializing in labor law, Carl retired early. He chose to continue in the "people helping" field - body therapy was a natural choice. Carl earned over the years, 21 certifications in body modality techniques. 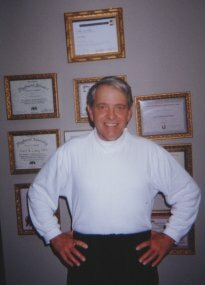 He has treated well over 15,000 people in his twelve years of practice. This site is owned, maintained, and copyrighted by Carl Long and ®O.I.U. Web Hosts ©1999-2003.